Get Relief From Those Seasonal and Pet Allergies!! My husband is allergic to pet hair and when we moved into our house three years ago, there was dog hair EVERYWHERE!!! We had to replace all the carpet to get rid of it and I felt like I was endlessly vacuuming to get rid of any other hair I found! I still randomly find dog hair! So you can imagine what all this pet hair did to my husband! His allergies kicked into high gear everytime he walked into our house! I hated that my husband couldn't be comfortable in his own home!! However, I am happy to say that today he has no problems being comfortable or allergy-free in our house! Because we invested in air purifiers for every room and that has made the biggest difference! Our house no longer has allergens floating around trying to attack my husband and I give most of my thanks to our air purifiers! 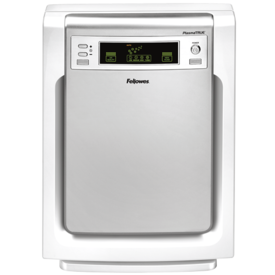 The air purifier that we trust the most and have in our own bedroom to help my husband be comfortable from allergies at night time is the Fellowes AP-300PH Air Purifier. The nice, compact but POWERFUL size: This air purifier doesn't take up too much room but it is very powerful and purifies a large area! It purifies large sized rooms up to 300 square feet and it operates very quietly so it doesn't disturb our sleep or keep us awake! That makes it perfect for our bedroom or any bedroom in your house! It is also sleek and doesn't stand out too much in our room but fits nicely in the corner, staying out of the way! The PlasmaTrue™ Technology: I LOVE this air purification system because it removes airborne pollutants at the molecular level, neutralizing viruses and germs in the air. The true HEPA filter captures 99.97% of particles and impurities as small as 0.3 microns. Air Purity Sensors: What sets this purifier apart from others we have is that it has air purity sensor monitors and it adjusts automatically according to particles and pollutants in the air. I love that I can visually see what the air quality is in our room. Filter change indicators : I am such a visual learner so I absolutely love that this purifier signals right on the display when the True HEPA and Carbon filters need replacing! The display panel also effectively communicates machine performance and what the air quality is in the room! The Fellowes Air Purifier is also really easy to use. There are only a couple buttons instead of a million confusing buttons like some air purifiers. They have made it simple to turn on, adjust for low, medium, hi and turbo settings, and that's it! You can just pretty much plug it in, turn it on and it is all set to go! You can easily adjust how loud it runs depending on if you like "white noise" or not. For more information visit fellowes.com/airpurifiers & http://www.facebook.com/Fellowes. Buy It: The Fellowes AP-300PH has a suggested retail value of $199.99 but it is on a GREAT SALE for only $119.99 on Amazon.com!